Chief Minister Bhupinder Singh Hooda today exhibited a show of strength on his home turf in Jatland and resorted to populism, promising new schemes for a cross-section of society costing thousands of croresto the state exchequer. The view was pink at the Shakti rally of Chief Minister Bhupinder Singh Hooda while traffic arrangements went haywire due to choking of roads by vehicles carrying Congress activists headed for Gohana. Congress supporters. both men and women, were clad in pink clothes and sported pink turbans, caps and 'chunnis' with masks on their faces. The “Jawabdehi Kanoon” announced by Chief Minister Bhupinder Singh Hooda in today’s rally in Gohana is on the lines of “Jan Sunwai Kanoon” (Right to Hearing Act) implemented by the Ashok Gehlot government in Rajasthan. Terming the act of school lecturers boycotting the evaluation process of classes X-XII examinations conducted by the Haryana School Education Board (HSEB) as unfortunate, Education Minister Geeta Bhukkal said the lecturers should understand their moral responsibility towards students before taking such hard decisions that hampered the future prospects of students. The case of the 17-year-old college student who was traced in Chandigarh after two days took a new turn with the girl reporting that she was abducted and gang-raped by three youths. A man was hit by a speeding dumper in Lakhuwas village, following which villagers set three dumpers on fire. A similar incident had caused high drama in the village a few days ago. With over 100 cases of dengue reported in the district this year, the number of such patients has increased four times as compared to the last year. However, the district health authorities have maintained that the situation is under control. An aged woman and her seven-year-old grandson were today crushed to death by a vehicle near the PWD rest house in Gharaunda, 25 km from here. The victims, Ramrati and her grandson Nasib, were rushed to the local Civil Hospital at Karnal where they succumbed to their injuries after a few minutes. The Indian Institute of Management (IIM) organised a mini-marathon for residents here today. Milkha Singh formally inaugurated the event, “Run for the Girl Child”. It was the third such event in three years. While Hooda’s populism may be good politics to woo voters ahead of the polls, it is certainly bad economics, putting a heavy strain on the already fund-starved state exchequer. With the Lok Sabha and state assembly elections next year, there is hardly any possibility of the imposition of new taxes. The Chief Minister had something for every section of society. be it aged pensioner, farmers, agiculture labourers, women, ex-servicemen, employees, policemen, rehri and phariwalas and students. 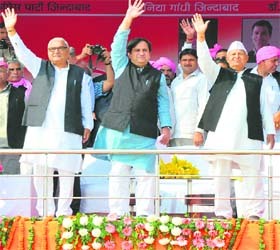 The political message of the rally, apparently organised to show Hooda’s strength in state politics, was clearly directed at the Chief Minister’s detractors within the party and the Congress high command that he was the only mass leader in the state to beat anti-incumbency and lead the party to victory for the third time. It also endeavoured to match the fairly successful rallies of BJP’s prime ministerial candidate Narendra Modi at Rewari and the November 1 INLD rally at Kurukshtra. However, the populist streak aimed at wooing the electorate was clearly the predominant theme at the rally. While the Congress leadership was upbeat at the announcements terming these as a landmark in the political history of Haryana, the Opposition was not impressed. “With anti-incumbency staring Hooda government in the face, the announcements are another ploy to mislead the people ahead of next year’s elections. In fact, many poll promises made during the last assembly and parliamentary elections are yet to be fulfilled and people cannot be taken for a ride again” alleged senior INLD leader Abhay Chautala. State BJP president Ram Bilas Sharma termed the rally a flop show vis-à-vis Narendra Modi’s Rewari rally. “As far as the populists announcements by Hooda are concerned, these are impractical as the state exchequer cannot spare so much money for the purpose,” Sharma alleged. Something for everyone in Hooda’s ‘sop opera’. Opposition scoffs at Hooda’s “unrealistic” announcements. Hooda’s detractors, especially Union Minister Kumari Selja, Rajya Sabha members Birender Singh and Ishwar Singh and rebel Congres MP Rao Inderjit Singh stayed away from the rally, briging factionalism within the Congress to the fore again.The absence of Hooda’s detractors was reflected in the crowd from the pockets of influence of these leaders as an overwhelming majority of the rallyists were from the Jat-dominated Sonepat-Rohtak-Jhajjar belt, considered to be the Chief Minister’s stronghold. The view was pink at the Shakti rally of Chief Minister Bhupinder Singh Hooda while traffic arrangements went haywire due to choking of roads by vehicles carrying Congress activists headed for Gohana. Congress supporters. both men and women, were clad in pink clothes and sported pink turbans, caps and 'chunnis' with masks on their faces. 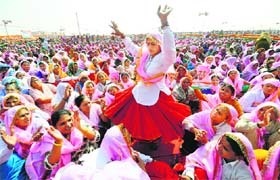 Around 150 women from Rohtak danced to the tune of the song “CM sahib ne Gohana bulaya hai, kheti ka daam badhaya hai” (CM has called us to Gohana and increased the price of farm produce) before the speakers addressed the rally. The entry and exit points to the rally venue at the new bypass in Gohana were choked with vehicles coming from all directions. 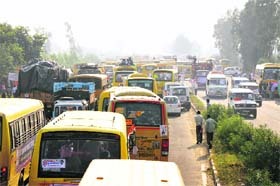 The traffic jam forced people to grapple to reach the venue. There were long queues of vehicles parked along the roads as the 300-acre parking area became inadequate. A large number of Congress workers wore T-shirts with “Hooda ke sipahi” printed on those or such stickers pasted on those. The “Jawabdehi Kanoon” announced by Chief Minister Bhupinder Singh Hooda in today’s rally in Gohana is on the lines of “Jan Sunwai Kanoon” (Right to Hearing Act) implemented by the Ashok Gehlot government in Rajasthan. The system is already in force in three villages of Fatehabad with the efforts of Sirsa MP Ashok Tanwar, though without any legal force behind it. Single windows to address people's grievances were opened in three Fatehabad villages - Hinjrawan, Khara Kheri and Bhirdana - in July this year. Tanwar, who is co-in charge of Rajasthan affairs in the AICC, said he had been following the Jan Sunwai Kanoon, a mechanism to address people’s grievances, ever since it was implemented in Rajasthan in 2012. He said he came in contact with social activists Aruna Roy, Nikhil Dey and their team, who had worked extensively in that state to promote the implementation of the Act. Under the Right to Hearing Act, 2012, (also known in Rajasthan as Sunwai Kanoon, 2012) people can put forth their grievances in writing under a single window at the panchayat building in their village. They get a pink slip as receipt and are given the date of their hearing in the block office within a week. Once the officers concerned have heard him, they either have to redress the issue or assign reasons in writing for not doing it within a specified time. Talking to The Tribune after the rally, Tanwar said though he had a plan to extend the grievance redressal mechanism in the entire Sirsa parliamentary constituency, the Jawabdehi Kanoon announced by Hooda would lend a legal force to such endeavours. Ninety hoardings of the Hooda government’s achievements and initiatives were put up at the venue. Haryanvi folk artistes narrated the highlights of the government. The booklet titled “Naye lakshya, naye keertiman” (new goals, new landmarks) was distributed among the people. The Chief Minister was so much engrossed in self-praise that he described the formation of his government through “defections” in 2009 as his achievement. “I formed the government in 2004. The Congress won 40 seats in 2009, but I converted 40 into 54 overnight and formed the government again,” he asserted. 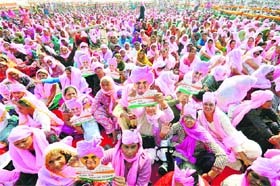 A large number of aged persons came to the rally with pink turbans and 'chunnis'. Hooda addressed them as his “gulabi sena” and announced that their pension would be doubled to Rs 1,000 per month. The venue, spread over 90 acres, was divided into 40 blocks. An area of 300 acres was earmarked for parking. The main stage, measuring 70 feet by 55 feet by 8 feet, was spacious enough to accommodate 200 persons. Another 100 persons were accommodated in the VIP gallery. Thousands of vehicles that made to the Gohana rally today were exempted from toll. The toll collector at the Panipat toll plaza said vehicles with a Congress flag or party sticker or “Chalo Gohana” tag were exempted from toll for today. Interacting with mediapersons at her residence here on Friday evening, Bhukkal said the state government never ignored the justified demands of any of the employees’ associations. Moreover, it always tried to make all possible facilities available to them, so that they could efficiently perform their duties, she said. Lecturers have been boycotting the evaluation of answer sheets of the first semester of Classes X-XII examination for the last two days following the call given by the Haryana School Lecturers’ Association. Hundreds of bags carrying thousands of answer sheets were lying at the two centres setup in the district for the evaluation of the answer sheets. The Haryana School Lecturers’ Association is demanding grade pay of Rs 5,400 at parity with the headmasters, special quota for PhD and NET qualified lecturers in the higher education institutions, change of the nomenclature of the newly appointed lecturers as PGT, and setting up of an inter-college cadre on the lines of Uttar Pradesh and Madhya Pradesh. “It is the moral duty of a teacher to accomplish those officials work well in time that are directly associated with the students, but it is unfortunate that the lecturers are boycotting the evaluation of answer sheets without realising the adverse effect of their action on the future of students,” said Bhukkal. The state Education Minister said several demands of the lecturers had already been approved by the Chief Minister while contemplation was being made on other demands. Despite all, some outfits were indulging in politics in the name of teaching, which was unjustified and inopportune, she added. “The lecturers should start evaluation of the answer sheets instead of running away from their moral responsibility so that students do not suffer,” Bhukkal called upon the striking lecturers. Meanwhile, district president of the Haryana School Lecturers’ Association Kaptan Singh said they would not evaluate the answer sheets until their demands were met. The BCom first-year student levelled the allegations in her application to the Deputy Commissioner. The police approached court to record her statement under Section 164 of the Criminal Procedure Code. Bhiwani Deputy Superintendent of Police Amit Bhatia today said the court of the Chief Judicial Magistrate rejected the plea as she had given her statement in court that she went to Chandigarh on her own. "The police approached the sessions court for getting her statement recorded. The police will take legal action on the basis of her statement under oath in court," he said. The girl, who went missing from home on October 22, initially informed her family that she had been abducted. The police traced her location in Chandigarh and brought her back after two days. In her statement in court, she had stated that she had gone to Chandigarh on her own and denied any wrongdoing with her. The case took the new turn when she, accompanied by her parents, handed over a complaint to the Deputy Commissioner, stating that she was abducted and gang-raped by three local youths who filmed it on video. The injured was rushed to a hospital while some villagers gathered at the site and set on fire not only the dumper which hit the man but two other dumpers, too. The villagers were infuriated as the police had earlier promised to set things right after two engineering students had lost their lives after being hit by a dumper on the Sohna Palwal road. The villagers of Lakhuwas and Dhohla along with students of the engineering college had gone on a rampage at that time. The villagers had blocked the road and pelted stones at vehicles and set a police jeep on fire to protest against the delay by ambulance and the police to reach the spot. They had also demanded a permanent solution to redress the problem of over-speeding dumpers. The authorities had promised to find a solution to the problem. The latest report compiled from all the hospitals put the figures at 104, with six more patients testing positive for dengue on Saturday. Three of the patients are from Mugalpura village of Uklana block. Data with the health department revealed that around 25 cases of dengue were reported last year and there were only nine such cases in 2011. Civil surgeon Dr Shriram Siwach, however, maintained that the higher number of cases had come to light due to the proactive approach of the health department this year as all the patients visiting private or government hospitals were tested for the disease. “Prevention by way of sanitation is the best way to contain the spread of this mosquito-borne diseases. With the decline in temperature, cases of flu will come down too,” he said. He said the health authorities had carried out fogging and had taken other measures to check the spread of dengue in the neighbourhood of persons testing positive for the disease. The police suspects that the duo were crushed by a Haryana roadways bus or an Innova which crossed the road at the time of the accident. The bodies were sent for a post-mortem examination. While the Innova driver blamed the roadways bus for the accident, eyewitnesses said the former was at fault . Innova driver Kartar Singh said he tried to avert collision with the Haryana Roadways bus on his way from Delhi to Karnal but an eyewitness said the sppeding Innova crushed the woman and her grandson. Addressing the participants at the prize distribution ceremony, the Flying Sikh lauded the efforts made by the IIM. He said it was one of the healthiest ways to promote a social cause. “It is our responsibility to make sure that women succeed in all spheres of life. I support any noble initiative that helps achieve such a social cause,” he said.